Originally published in 2014 on my other blog. This spring and summer I rode my burly foxhunter, Midas, through fields performing the one-rein stop every 10 steps or so in order to, 1) learn the thing, and 2) not be bolted with. Now we have pretty well mastered the maneuver as taught by Clinton Anderson in his Down Under Horsemanship book–and the effects have been astounding. The one-rein stop consists of reaching about halfway down one rein, and then in a smooth (not abrupt) motion, drawing your hand back to your hip. This draws the horse’s head around to his shoulder. Your other rein hangs completely loose. The instant the horse yields–by bringing his nose closer to you than the rein requires, thereby removing the pressure of the rein–and stops his feet, you drop the rein as a reward. Before you tackle this while moving, you master it while standing still; this way the horse already understands how to yield before you incorporate stopping. Oddly, the one-rein stop is a very soothing exercise. 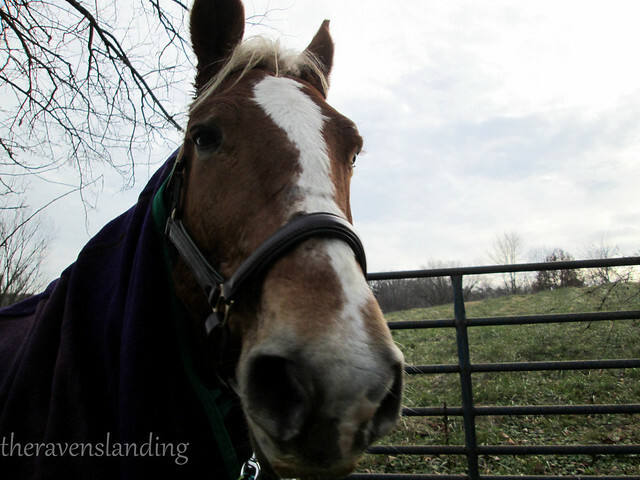 It’s hard to say if it soothes the horse or rider first, but there is a calming rhythm and familiarity to it. The rider is suddenly aware that he or she can stop the horse easily and without conflict, and the horse likewise realizes that the rider won’t grab or be harsh, and it knows what to do to release the pressure. Everyone knows what to expect, and that’s very soothing. This is Midas’s post-hunt-so-tired-please-can-we-stay-with-the-hounds? face. The net result is not only a horse who can be stopped (no small matter when you ride a horse who bolts) but a confident rider. Over the past several months, both of my young in-laws have had the opportunity to stop bolts. The most recent take-off the 16 year old rode by himself out of voice-shot and handled perfectly. He then continued with the ride as if nothing had happened, both horse and rider in a good mental state. I’m completely delighted at the prospect of bolts being non-events rather than ride-defining moments. This has resulted in a sort of revolution for Midas and I. Because you don’t need a short rein to stop the horse quickly, you can ride with a longer one. This has, in turn, enabled me to finally connect the dots between contact with the horse’s mouth, rein length, and sitting up straight. I’ve been actively working to sit taller (fighting those years of hunt seat equitation), tuck my seat under, and when I do have to pull on the reins or half-halt, the action comes from the elbow and shoulder rather than just the hands. Although I’m riding on a longer rein, there is not, interestingly, a loop in the rein. With all the puzzle pieces falling into place, Midas is not abusing the longer rein. Instead, he’s stepping into it and stretching his neck into it, like my High School Riding Instructor always said the horse would. We have stumbled on the secret to traveling in the fabled frame lauded by dressage instructors everywhere. Finally and unexpectedly, the longer rein has suddenly enabled us to canter. It’s embarrassing, but I couldn’t induce Midas to canter much in the ring; and it was hard work to hold him balanced when we did canter. As it turns out, I was holding his head too high with a too-short rein, and he was having to work his tail off to stay balanced at all. 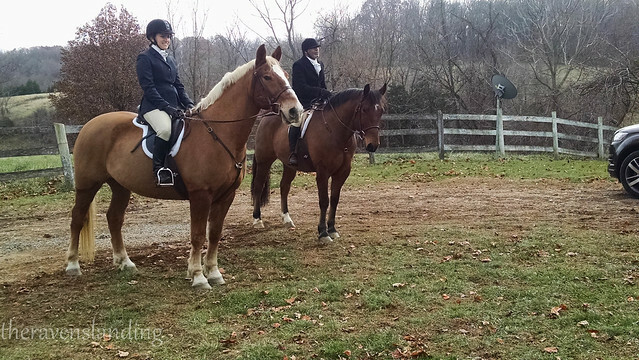 On the longer rein–with my elbows and shoulders back and my seat tucked under–he reached of his own accord into the contact of the rein, and I could use my legs and seat to keep his weight back and balanced. The confidence of the one-rein stop unlocked a palace of riding treasures for my bolt-prone mount and I. It has lessened the frequency and severity of bolting incidents, led directly to mastering other horsemanship skills and concepts, and given us the ability to canter responsibly. The One-Rein Stop is great. Tried painting some beach scenes with my watercolors. Man, color mixing is a real art form. I’m much more familiar with acrylics, and I have a bajillion colors to choose from. Very rarely do I need to do anything more complicated than tinting the colors. Time to grow as an artist! These are scenes from my favorite beach on Cape Cod.